Wakate Noh – young Noh and Kyogen performers from the Kanze, Kongo and Okura schools will perform on the Kanze Kaikan stage on Saturday 27 June 2015 from 11:00. Udaka Tatsushige will take the shite in the Noh Miwa, the first play in the schedule, featuring the kagura instrumental dance. Feel free to contact me for more details and/or tickets. Young actor Tatsushige Udaka makes his debut in the vendetta play Mochizuki. I bet you never thought that Noh could be so AMAZING. Come see for yourself on March 14th. 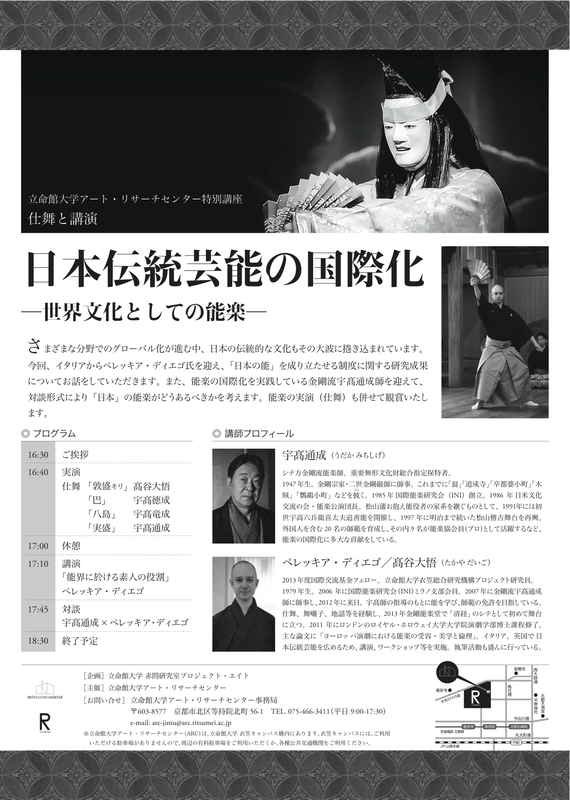 On 14 March 2015 Udaka Tatsushige (first son of the INI founder Udaka Michishige) will hold the first Tatsushige no Kai, an annual Noh performance event he is producing, featuring high-caliber actors and musicians. Each year Tatsushige is going to take the main role in a particularly challenging play from the Kongo school repertoire. On the occasion of this first Tatsushige no Kai, Kongo Hisanori, grand-master of the Kongo School, has chosen for him the virtuoso Noh play Mochizuki. Family tickets and ‘next generation’ tickets for students and Noh theatre beginners are available! Check out the full program in English here! Udaka Tatsushige, son of the INI leader Michishige, will perform the virtuoso Noh Mochizuki on March 14th 2015 on the occasion of the first Tatsushige-no-kai series performance event. Mochizuki is a dramatic vendetta story featuring the famous lion dance, normally associated with the Noh Shakkyō, here performed by a man wearing a lion wig, golden fangs symbolising the lion’s jaws, and a red cloth to cover his face. You can watch here the promotional video of the event below. 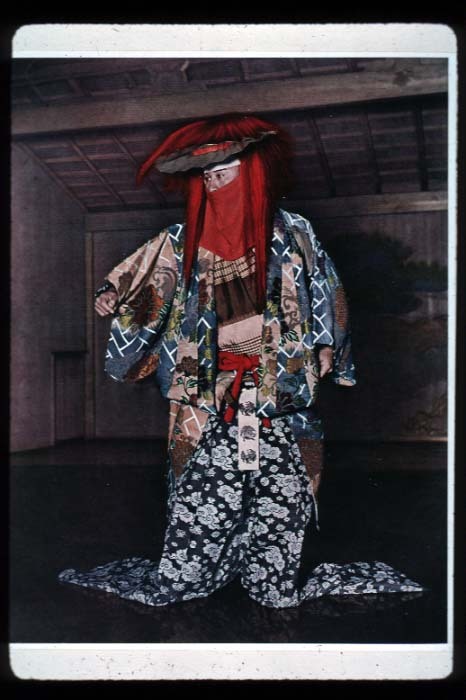 Speaking of Mochizuki, this is a Meiji-period colour photograph of an actor dressed for the role of Kozawa no Gyōbu Tomofusa, the main character of the play, part of Albert Kahn’s Archives of the Planet. “The Japanese Extreme” is the headline of the third night (29 May) of the London Contemporary Music Festival 2014 at Britannia House, Spitalfields, London. The organisers have put together an impressive and bold line-up that crosses genre boundaries: Karlheinz Stockhausen’s Himmels Tür, (a percussion piece of Japanese inspiration) the Japanese noise act Pain Jerk, and…… NOH THEATRE. Udaka Tatsushige and Udaka Norishige, sons of my teacher Udaka Michishige, along with four hayashi musicians from Kyoto and Osaka will perform the ibayashi (solo music and choir) of Shakkyō (The Stone Bridge), and the maibayashi (dance and music excerpts) of Hagoromo (The Celestial Robe) and Funa-Benkei (Benkei and the Boat). I will sing in the ji-utai chorus. 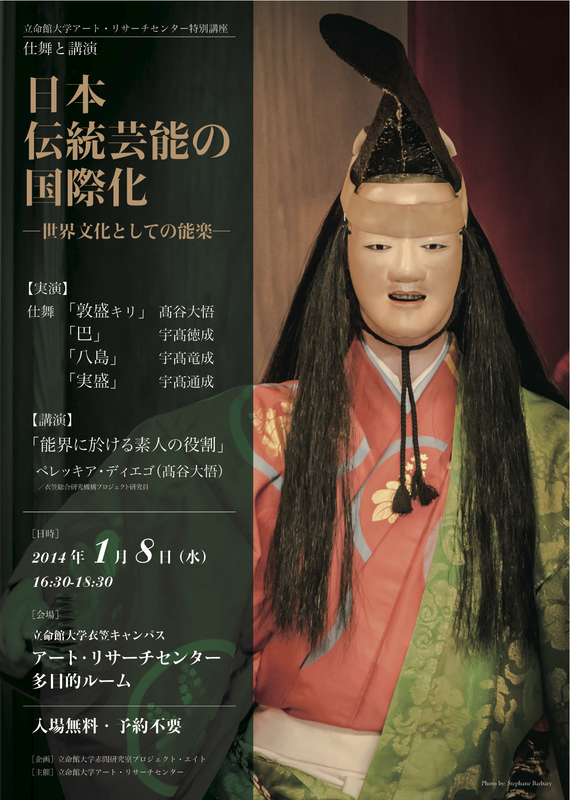 The repertoire we are going to perform is classic, and will be put on stage according to the Noh conventions. It is rather unusual for Noh to be performed along with other acts, all the more so in the context of a contemporary music festival, and we are very excited and honoured to participate to the LCMF this year. If you are in/around London don’t miss the chance to attend this unique event! Visit the LCMF website for the full programme and ticket reservation.